Mister Rogers opens by doing some basic movements with viewers -- movements such as taking tiny steps, big steps, hopping, and clapping. He talks about growing and watches a film about babies growing into children. 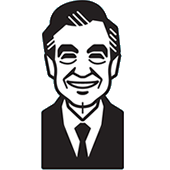 While the film plays, Mister Rogers sings You're Growing. Mr. McFeely stops by with an aquarium holding leopard frogs and tadpoles which he takes to the kitchen. He and Mister Rogers talk about how the tadpoles are growing into frogs. In the Neighborhood of Make-Believe, Mr. McFeely and Robert Troll are visiting the Westwood Children's Zoo. After looking at a variety of animals, they thank Mrs. Frogg for letting them visit the zoo. King Friday arrives looking for Queen Sara and finds that she is still with Dr. Frogg. When Dr. Frogg and the Queen arrive, it is revealed that the Queen is in perfect health. Back at the house, Mister Rogers waters a plant and sings more of You're Growing before talking a bit more about children growing. As Mr. McFeely takes the lid off of the aquarium, one of the frogs unexpectedly jumps onto the floor. It takes Mr. McFeely a moment to corral the slippery animal. The frog escapes again as Mister Rogers is leading into Make-Believe.